"!!*X$&*!! Jerk! 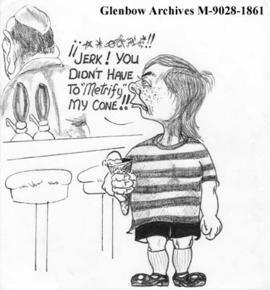 You didn't have to 'Metrify' my cone!!" ""Don't you know that drinking is a disease?" 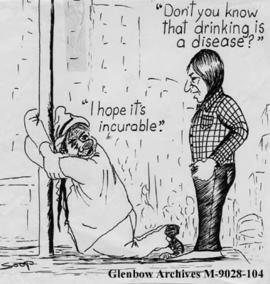 "I hope it's incurable." "$43 Million facelift for Alta. Legislature: Suits my humble origins!!!" "'The Chief' from the Peace Tower to Peace"
"'Y didn't Ya Vote fer Me? ";"You didn't give out $10." "*x*x!! Weather! Can't Do Anything!!! ";"To nice a day to work!" "*x*x!!! Get up front. Don't overdo the meek bit!!!" "...a dog and frog and a train";"...a gun and a knife and tank..";"...and car and truck and jeep an";"...and a bus and a pony and"
"...and a Happy and Prosperous NEW YEAR." "25 cents! Ain't you the lucky one. I need a million."